Think you know what’s healthy? Compare your knowledge to others. You might find the results surprising! QUIZ: Which Food Contains Less Saturated Fat? Health Smarts is an organic food producer, dedicated to promoting healthy choices and healthy lifestyles. Our weekly blog is full of helpful tips and keeps you up to date on the latest health trends. We invite you to join our monthly newsletter to get new recipes, informative articles and find out how you can save when you purchase our products. We Want To Give You Our Recipe Book “Health Smarts - 10 Minutes To Health” For Free! Making healthy choices can be challenging. So we want to help you by making those choices easier. For a limited time, you can get our Best Selling book, “Health Smarts - 10 Minutes To Health: Easy Recipes to Fit Your Lifestyle” for free. This book is full of healthy recipes that are easy and quick to prepare so you can fit being healthy into your busy life. But act now. Once the timer has run down, this offer disappears. Get “Health Smarts - 10 Minutes To Health” Now! ANSWER: Which Food Contains Less Saturated Fat? One piece of Boston Creme Pie (92g) has 2.249g of saturated fat and a single serving of pork chop (lean and fat) has 3.196g of saturated fat. Surprised? 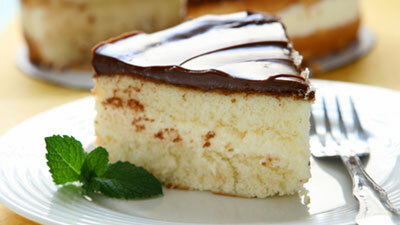 According to USDA reports, a serving of Boston Cream Pie (which is really a cake) has 2.249 grams of saturated fat. 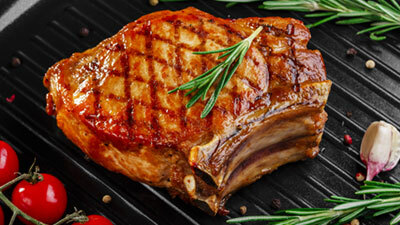 A single serving pork chop, (lean and fat) has 3.196 grams of saturated fat. What’s more, there are actually more good fats in a piece of Boston Cream Pie, than in a pork chop. Want to be able to use this type of information to make healthy choices and make healthy food, fast? Get our recipe book, “Health Smarts - 10 Minutes To Health: Easy Recipes to Fit Your Lifestyle” now, before time runs out! Want to get more interesting facts that you can use in your everyday life? Sign up for our monthly newsletter.